After a light brekkie we donned the rucksacks and walked the 500m up to the bus station to catch our ride to San Carlos. There we made a very hassle free connection to Manantiales, meaning Springs which is a small village about 12km outside Punta del Este itself. Punta del Este is the most exclusive resort in South America – they often call it things like the Monte Carlo or Las Vegas of the south. I had worked in La Barra, a summer party town a few km up the beach for a season years ago and was looking forward to reminiscing. We had about 15 minutes to wait – just enough to buy a carton of fine Uruguayan wine and the biggest chicken milanesa sandwich I had ever seen in my life. We then had a pleasant 30 minute journey to Manantiales in a very posh bus with panoramic views. The buses had certainly improved since I was last there. Things had started to look a little familiar when we swung into La Barra straight past the place where I had worked. It's named had changed to PooMas and it looked as if it hadn't been open for a long time. That fitted the picture as things only hot up at the end of December and then go quiet in February. A waft of memories entered my mind as we passed through the little town i had called home for 2 months in 1998. Not much further up the road we came to Manantiales and the conductor helped us off at the universal hostelling sign with the tree and the little house. 400m, althoughI suspect more like 700m and we came to the hotel (el viajero if you are interested). A little over 3 hours door to door – travelling in Uruguay is such a pleasure! Our dorm wasn't ready so we sat down and supped some mate and ate the biggest milanesa sandwich in the universe before hopping on a bus to Punta del Este. 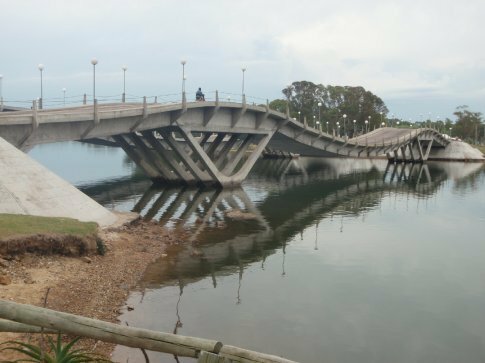 We passed over the bendy bridge in La Barra, a curious shallow m shaped bridge that personifies the town, before moving towards the high rise apartment blocks that line the beach on the way to Punta, many more than there had been 10 years ago. One of my favourite things about Punta is “los dedos”, the fingers, a set of giant sculptures of the sculptors fingers sticking out of the sand. We took our snaps, feet burning in the sand, and walked around the point and the old town with its lighthouse, because of which no buildings can be constructed taller than it. This is great as the entire city would otherwise be a super tall collection of steel and glass shrines to capitalism. We wandered up to the old port and, as it was really starting to heat up, decided we should go back to the beach and cool off for a while. We swam on the pretty Playa de los Ingleses, jumping about in the rollers and played some Frisbee. We then had, as Claire says, a “lovely sleep” on the beach for about an hour. The loveliness can be proven by the fact that Claire was dribbling heavily when she woke up ... I suspect the last time she dribbled on a beach was somewhere in France when she was camping with her parents as a ten year old. After our nap we went back to the port and strolled amongst the enormous yachts and powerboats, chancing upon a collection of white linen betrousered botox ridden ladies waiting in their air-conditioned chauffeur driven Lexus. Clearly a species in their natural environment. Sea lions splashed about waiting for the fishermen to gut their fish and the seagulls remained present but strangely silent. Even the seagulls are posh in Punta. As we wandered back to get the bus to the hostel Claire saw an Apple sign. In the vague hope of finding some sort of solution to my empty ipod issues I went up but alas it was closed. On staring in for a while one of the apple dudes inside came out and entertained my technical questions, even suggesting a theoretical solution .... perhaps I would get the tunes back again – this was worth exploring. I had resigned myself to itunes prostitution for the rest of the trip. It didn't matter what they said though as I didn't have the Ipod with me anyway. We went back to the hostel for some Chivitos, Uruguayan speciality steak sandwiches. We had a relatively mellow evening despite the fact that the hostel was busy with a group of people who had made friends there and were heading off the next day. We chatted to some decent Swedish blokes who we could have sworn were gay but who mentioned their girlfriends and a slightly bizarre girl from Gillingham who Claire stayed gossiping with while I availed of the free internet. Breakfast the following morning was fairly nasty luke-warm coffee and not so good bread, aptly matching the overcast day, so we took the bus back into my potential ipod saviours as soon as we could, ipod held tentatively in my hand, like a patient on a gurney heading into brain surgery. Fede, the guy in the shop seemed confident about the prognosis and was very pleasant and professional. I gritted my teeth and made techy small talk while he performed the essential open heart surgery on my music. Apprehensive we went back to the Apple store. Would the transplant work? Would I have my music back for the 10 months or so that remained of the journey? In short, yes I would. The genius with his Mac OS X had done it and managed to save everything but my podcasts. I wanted to kiss him but he settled for the alfajores I had bought him as an anticipatory thank you gift. In celebration I bought a pair of headphones to replace the ones I left on a bus coming back from Maccu Picchu ... and gave him a hug. We got off the bus early in La barra, primarily so I could relive some old memories. The bendy bridge was still lots of fun, more like a fairground ride than a piece of civil engineering. Up the street we went past my old restaurant – there was a person cleaning up outside so I said hello and he let us in to have a look around. It looked almost exactly the same, perhaps a few more coats of paint but the bar I had spent so many hours behind was still the same. We went up towards the centre of the town – the main bar, Aquabarra, had now become an estate agent but at least the beach hadn't changed. It was great to walk along cangrejo beach and see that the gazillions of tiny crabs where still there, justifying the name we gave the beach so long ago. Flashback city. Breakfast was improved, but only marginally, by the addition of cornflakes the next morning after which we caught our bus to Punta. This connected us to Tres Cruces bus terminal in Montevideo which is integrated into a shopping centre. Our hour there allowed us to have a great chinese for lunch before hopping on the next bus to Colonia de Sacremento in the far west of Uruguay. The new headphones complemented my hangover perfectly. Colonia's origins find themselves as the principle smuggling town of English goods into the Spanish empire, via Buenos Aires, in the sixteenth century. The Spaniards unsuccessfully tried to maintain a shipping and trade monopoly with the new world but the competition was too great. We marched up to the old town from the bus terminal and found a beautiful hostel with a fine courtyard, high ceilings and wifi which worked in the room (Hospedaje Colonial). We used the wifi to sort out our accommodation in Bs As and work out the times of the ferries then headed out for dinner – Chivitos again as it was our last night in Uruguay, which Claire had fallen in love with, and I had reaffirmed my love for. If you have a chance – go. Not during January or February though as it's full of rich Argentenians and Brazilians. We walked off our Chivitos around the picturesque old town. We also wired the money to the landlord of the apartment we were going to rent in Bs As. The only Western Union open was the one in the Radisson Casino which seemed to be having OAP night ... filled with older ladies religiously pouring money into the slots. Mom, you would have loved it! Colonia is beautiful, with cobbled streets, 19th century lanterns, 1930s cars and horse carts all around the old town. Just to liven it up a bit a street samba band with earnest drummers and flamboyant dancers came along just as we left the cafe. We finished the evening with a delicious ice cream. We still hadn't sorted out our ferry tickets or gotten the US$ cash required for the apartment in Bs As yet so morning consisted of running around sorting things out and a breakfast of fruit in the ferry terminal. We took the Colonia Express 10.45 catamaran to Bs As (Mode of Transport number 24, (MOT granted as the last catamaran in Manu in Peru had no engines, was made of wood and powered by Saturnino the ex-park ranger rather than rolls royce engines). 50km in 50 minutes. This part of the trip I had been looking forward to for a long time. About 10 years to be honest. Mi Buenos Aires querido, Buenos Aires no duerme, En una noche todo puede pasar. The tall buildings of the city of 15 million porteňos rose over the brown waters of the Rio de la Plata as we approached. Just read some of the blog - the bit about the putrid whale on the beach was not great over lunch but there you go! Looks like you're having fun. Enjoy the rest of your trip.